These will be available on SHM-CDs in Japan December 17. The audio will be the same as the regular 2009 stereo release, as will the booklets accompanying each album. However, this edition will mimic the original LP packaging. The SHM-CD (Super High Material CD) format features enhanced audio quality through the use of a special polycarbonate plastic. Using a process developed by JVC & Universal Music Japan discovered through the joint companies' research into LCD display manufacturing SHM-CDs feature improved transparency on the data side of the disc allowing for more accurate reading of CD data by the CD player laser head. SHM-CD format CDs are fully compatible with standard CD players. See also recent news items about SHM-CD releases by John Lennon, Paul McCartney and George Harrison. 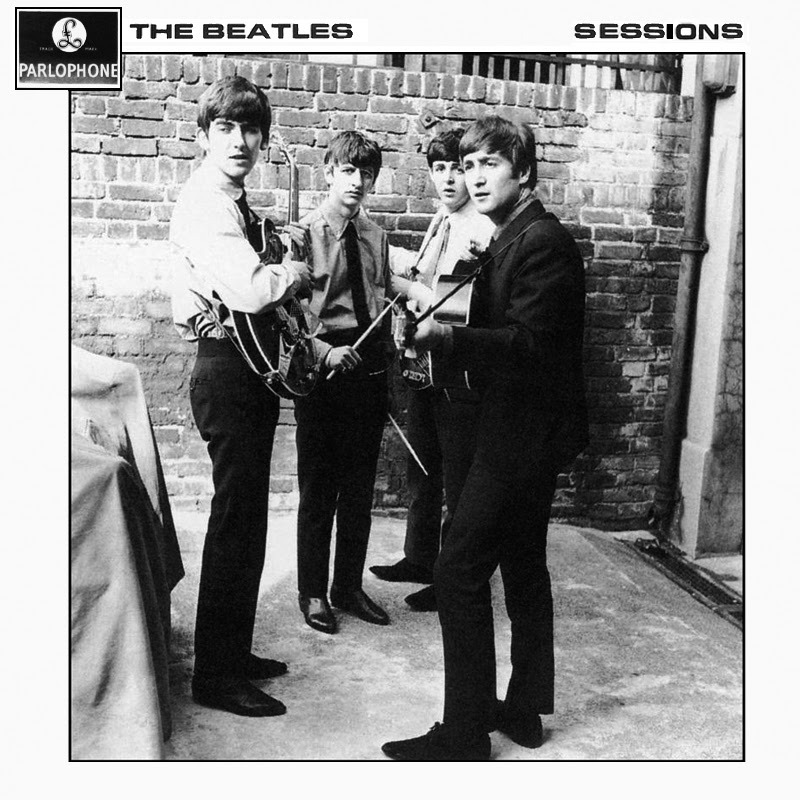 In 2011, "The Beatles' first featuring Tony Sheridan" was released on a SHM-CD. While we were sleeping on the job, some Ringo Starr SHM-CDs passed under our radar, too. "Live at the Greek Theatre 2008" and "Y Not" was released in 2010, "Ringo 2012" in 2012, appropriately enough, and on December 3, 2014, "Photograph:The Very best of Ringo Starr" will be out. Planned for SHM-CDs in 2010 but eventually cancelled and left unreleased, were "Ringo the 4th", "Bad Boy", "Ringo's Rotogravure" and "Vertical Man". Since 2011, a bunch of Paul McCartney's releases in Japan have also gotten the SHM-CD treatment. These include all the McCartney Archive releases, including the new ones, plus "Driving Rain", "Off The Ground", "Chaos And Creation in the Backyard", "Run Devil Run", "Kisses on the Bottom", "Amoeba's Secret" and all editions of "New". Today, Paul McCartney has shared a version of "Letting Go" which is not part of the upcoming "Venus and Mars" package. 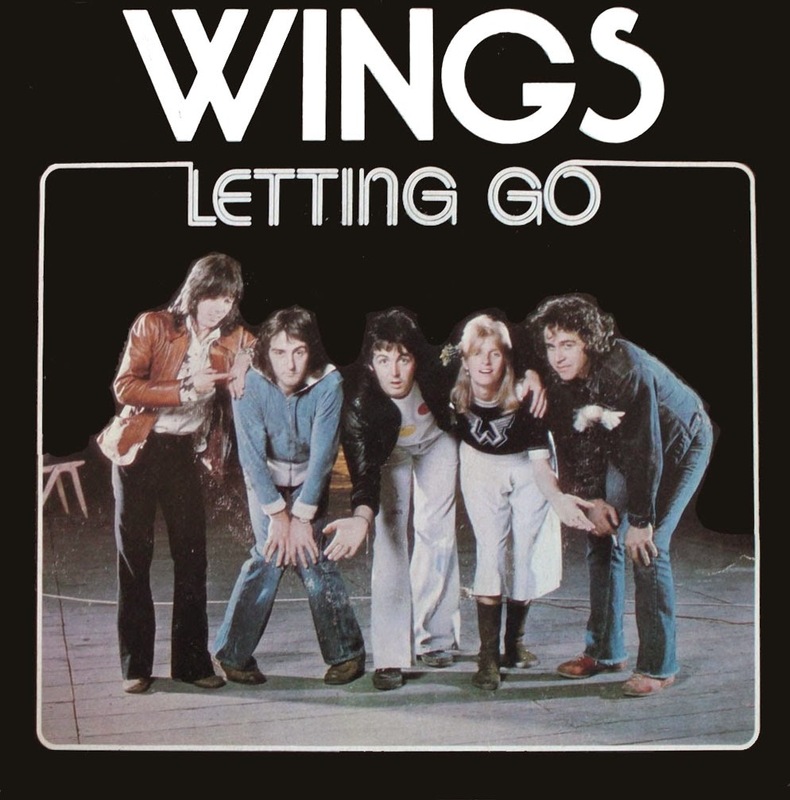 It's an extended and remastered version of the classic Wings track, available to download for free from this page. The new batch of Beatles vinyl albums are being readied for release. 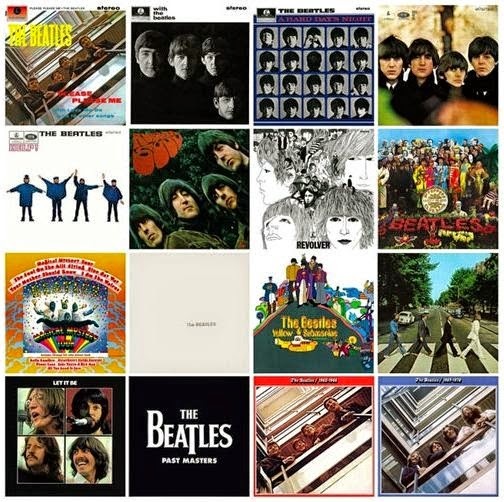 As we noted in September, Universal Music/Apple are set to rerelease some of The Beatles' double vinyl albums for the Christmas market via their joint Calderstone company. Amazon in Germany and France are early as always, and they are inviting preorders for "1", "Love", "1962-1966" (aka "The Red Album") and "1967-1970" (aka "The Blue Album") which all are due out in these countries 21 November. Expect them to be released a few days later in the UK and USA. The "1" album is likely to be based on the remastered edition of the CD, but since no official announcement has been made yet, we can't know for sure. We are hoping that this is not going to continue with the release of old albums like "Rock and Roll Music", "Love Songs", "Beatles Ballads", "Reel Music" etc. The Rolling Stones are releasing another volume in their new series of live concerts from their archives, "From The Vault" with "LA Forum" from the 1975 tour on 17 November on CD and DVD. We'd be delighted if Universal Music/Apple could do something which was more along those lines, but then again, the Beatles never followed in the footsteps of the Rolling Stones. It was always the other way around. 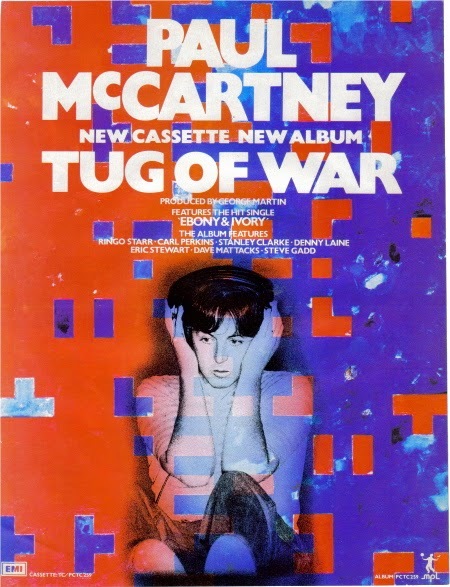 Advertising poster for "Tug of war", 1982. 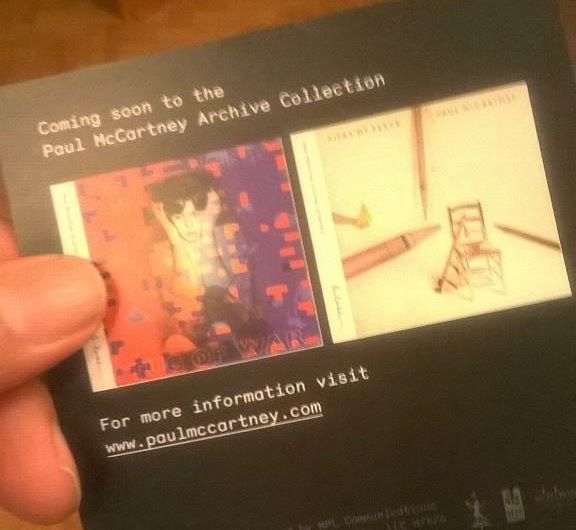 According to someone who has received an advance copy of the "Venus and Mars" and "Speed of Sound" sets, the card in the package announcing the next releases are saying that these will be "Tug of War" and "Pipes of Peace". This is a deviation from the 2011 "insiders information" list, which we also posted in this blog back then. Apart from "Wings Over America" being released before schedule, this is the first major deviation. It seems fitting to release "Tug of War" and "Pipes of Peace" simultaneously, since a lot of the tracks on "Pipes of Peace" were leftovers from the excellent "Tug of War" album recording sessions. Of course, there's no indication as to when these new releases will be scheduled. 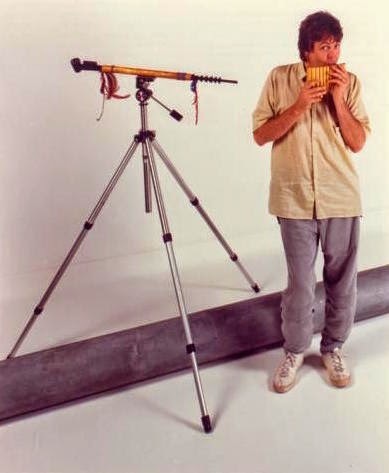 Pipes of Peace promotional photo, 1983. Still, those of us who wanted the full Wings ouvre to be next in line, with the promised "Wild Life", "Red Rose Speedway", "London Town" and "Back To The Egg", alongside a proposed Wings live CD and DVD from 1979 are disappointed. Update: A spokesman for Concord Music has told Beatles Examiner that despite this card, the plans for the next archive release are still not definite. 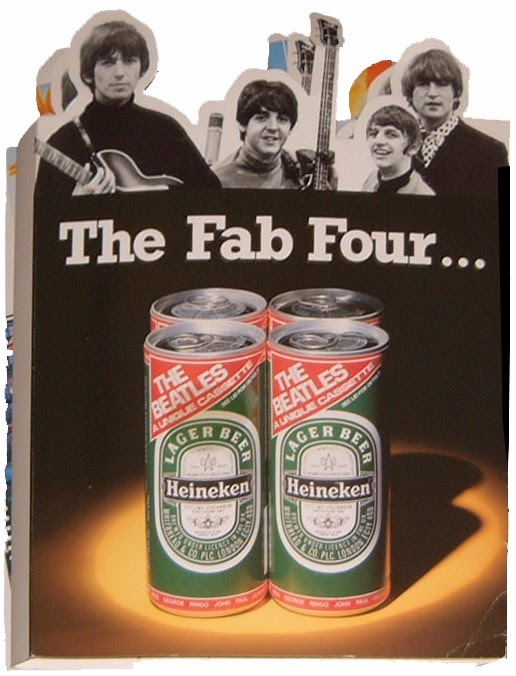 In 1986 EMI Parlophone in the UK put together a promotion with Heineken, unusual for the fact that the Beatles have rarely lent their name to brands for advertising purposes. 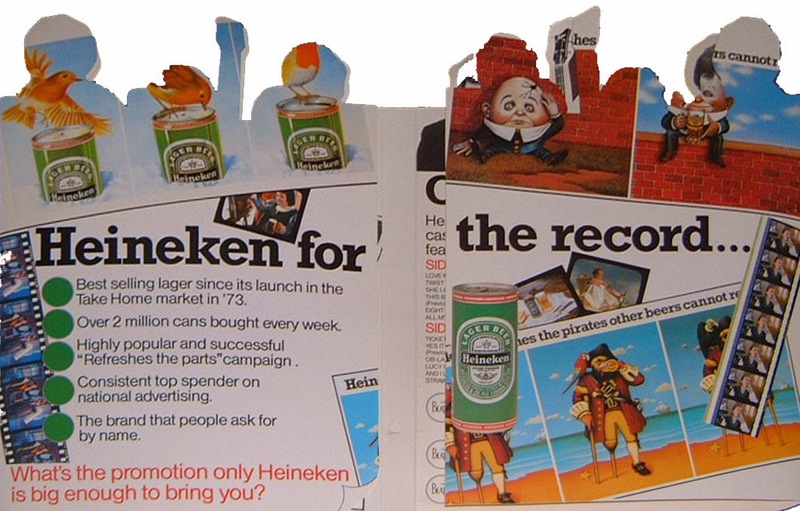 Specially printed cans of Heineken beer were made, featuring a red triangular banner across the top that said "The Beatles - A Unique Cassette", in white, bold capitals. 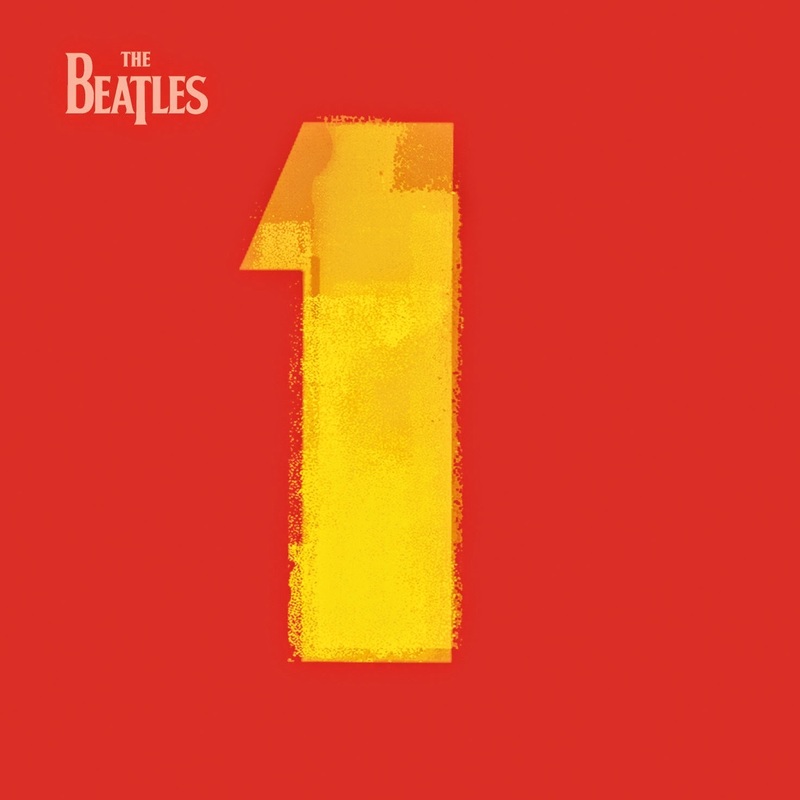 Around the bottom, the Beatles' first names, in capitals, in white on a red background, repeatedly circled the entire can. The cans came in two sizes : 275ml and 440ml of beer. The can was available only in Great Britain. 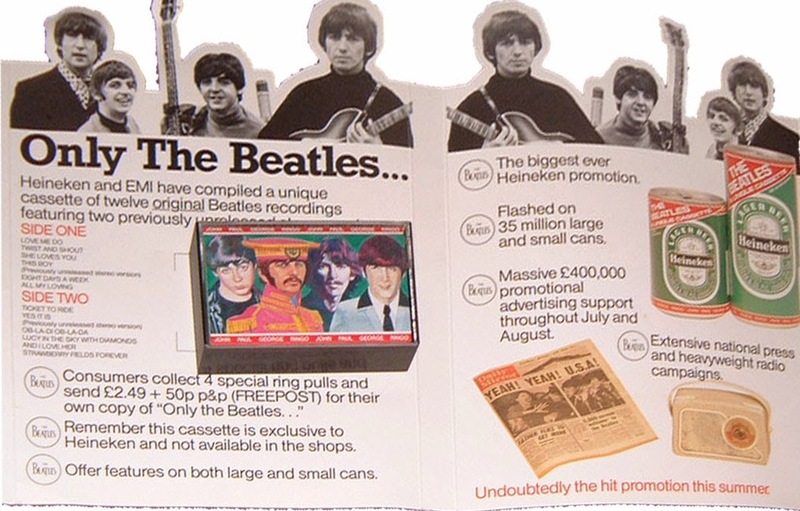 By sending in four special ring pulls from the cans and a crossed postal order or cheque for £2.99 (£2.49 + 50p P&H) made payable to "Heineken Beatles Offer", consumers received a special copy of a unique EMI compilation cassette titled "Only The Beatles..." (Parlophone/Stiletto SMMC 151). You could apply as many times as you liked. The offer ended on June 30th 1986 and production started on July 1st. The cassette claimed to include two tracks that had not been previously made available in stereo, but only "Yes It Is" lived up to the hype as "This Boy" was in fact mock-stereo. 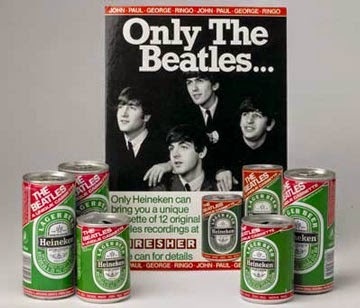 Copies were sent out with a gift card, of which there were two versions - the green card came with Heineken's logo on the front whilst the red version had a picture of the Beatles on both the front and on the inside. The compilation was ℗ &© 1986 for Stiletto Limited, 122 Holland Park Avenue, London W11 4UA, with project realisation by Paul Watts (Stiletto) and Norman Bates (EMI). 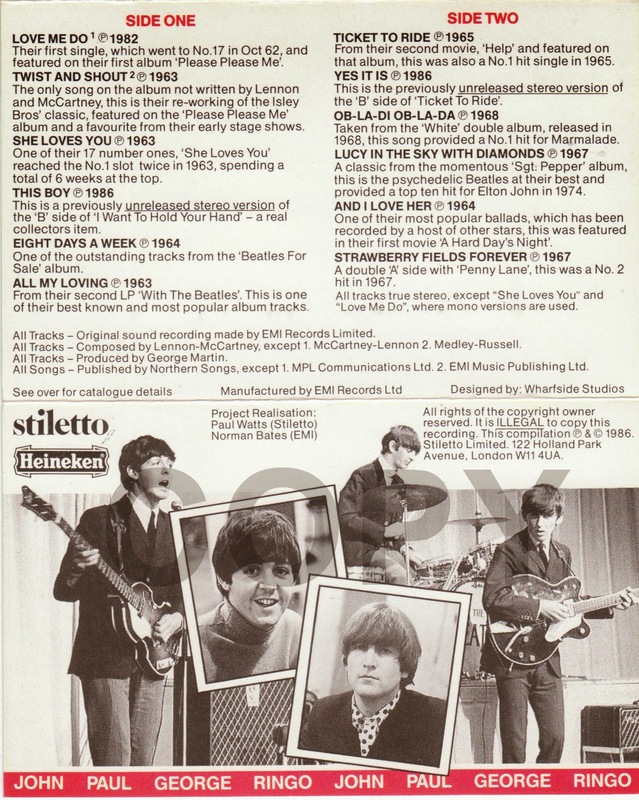 The back of the inlay card advertised The Beatles' catalogue of albums. 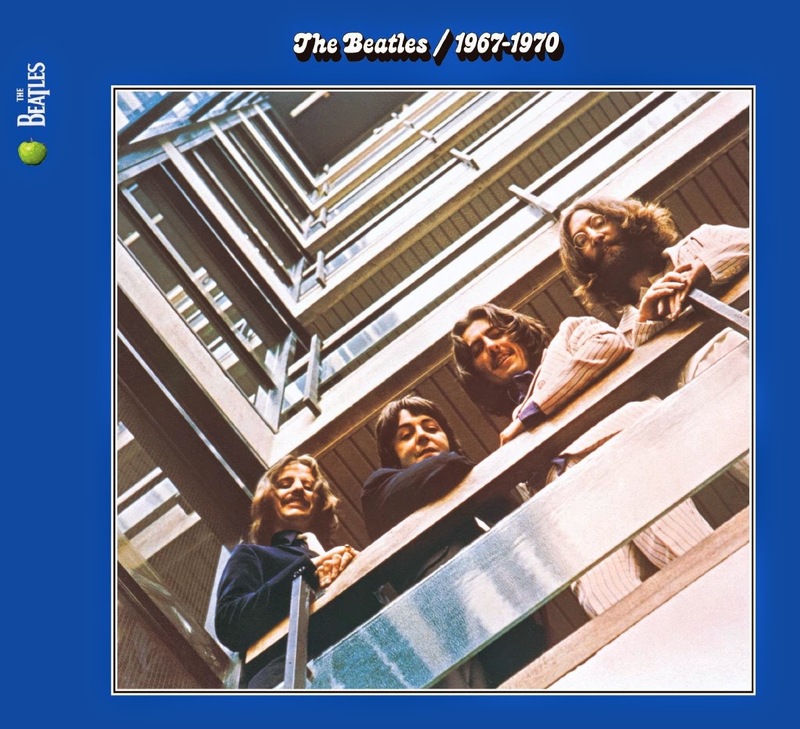 Not happy with the arrangement, Apple Corps Ltd sued over it on the 18th of July, 1986, EMI got cold feet and the promotion was halted quite swiftly, thus rendering the cassettes valuable. In 2007, UK magazine "Record Collector" reported that it had been rumoured that a large cache of cassettes were found in the late nineties, so there are probably more of these cassettes in circulation than previously thought. 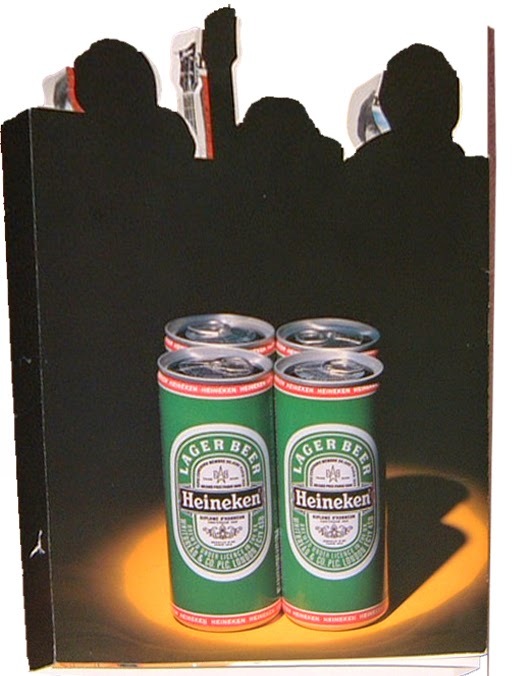 Thus, a cassette can be bought for £5-10 GBP whereas the promotional beer cans are usually more expensive - unopened even more so! Full packages of the cassette, the promo poster, gift cards and beer cans are commanding higher prices than each item in itself. 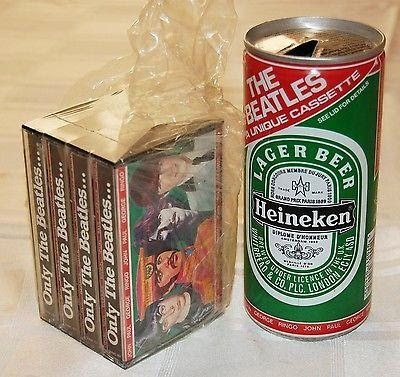 4 cassettes in the original cellophane and a used beer can went for $68.22 USD on ebay in September 2014. The cassettes were originally sealed in packs of 20 in this cellophane wrapper. The Beatles pop-up on the left side. 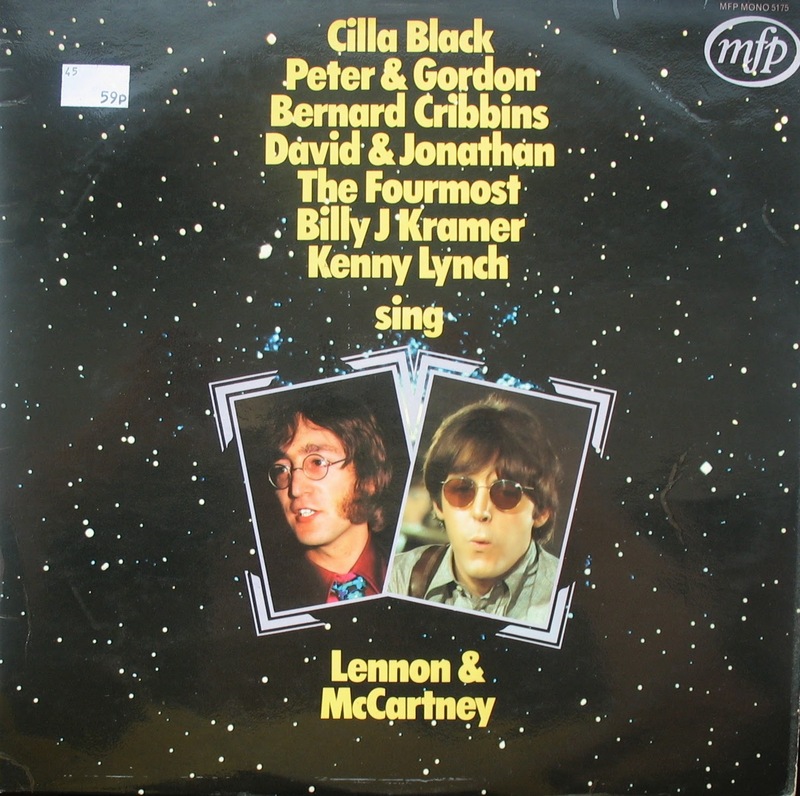 The Songs Lennon & McCartney Gave Away LP from 1979 on EMI. 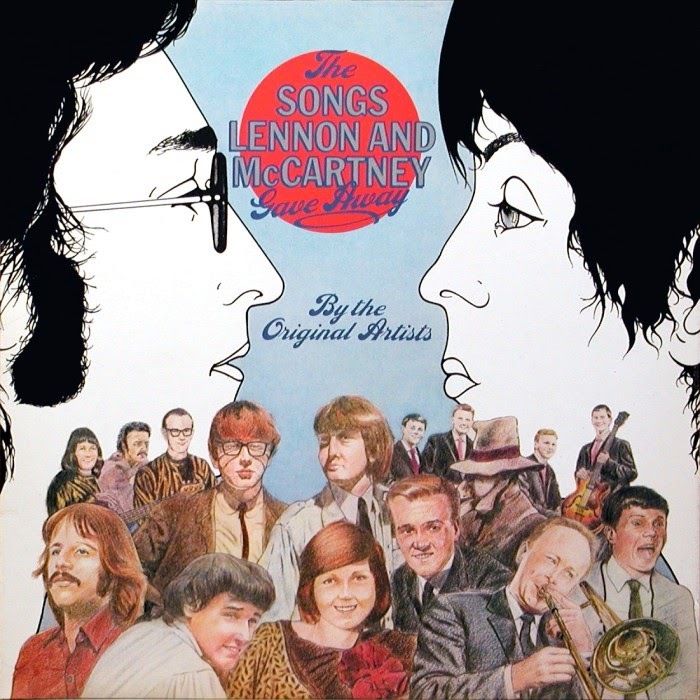 "The Songs Lennon and McCartney Gave Away" was a conceptual compilation album containing the original artist recordings of songs composed by John Lennon and Paul McCartney in the 1960s that they had elected not to release as Beatles songs. 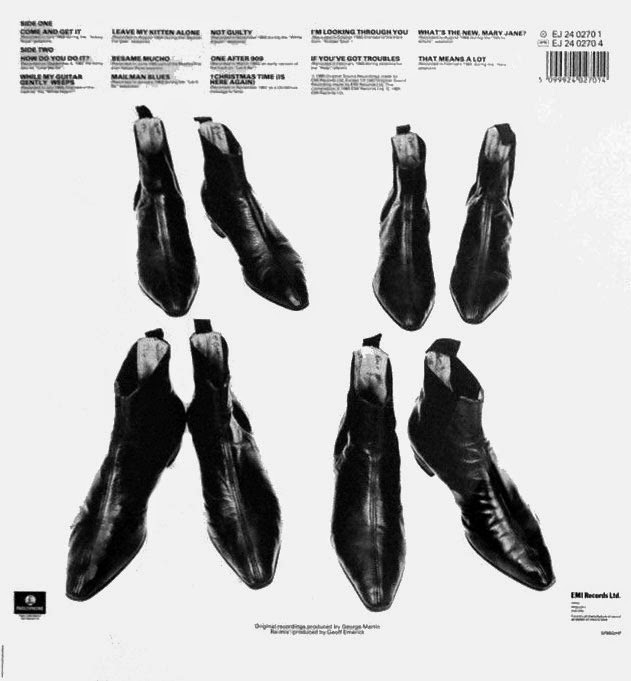 The original album was released in the UK on EMI's mid-price Music for Pleasure label in 1971. The album was reissued by EMI in 1979 with a 1973 Ringo Starr track added. Earlier in 1979, the Swedish chapter of EMI released an album which dealt with the same subject, called "Northern Songs" (Cat. no. EMI 7C 038-06829). The album contained: "Bad to me", "I'll keep you satisfied", "From a window" and "I'll be on my way", all by Billy J. Kramer & The Dakotas, "It's for you", "Love of the loved" and "Step inside love", all by Cilla Black, "I don't want to see you again", "World without love", "Nobody I know" and "Woman", all by Peter & Gordon, "I'm in love" and "Hello little girl" by the Fourmost. 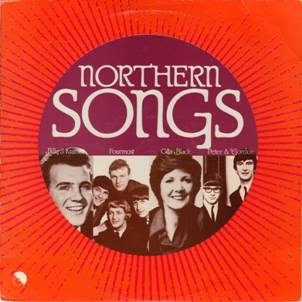 All the songs from the 14 track "Northern Songs" album were repeated on the 20 track "The Songs Lennon & McCartney Gave Away" later that same year. 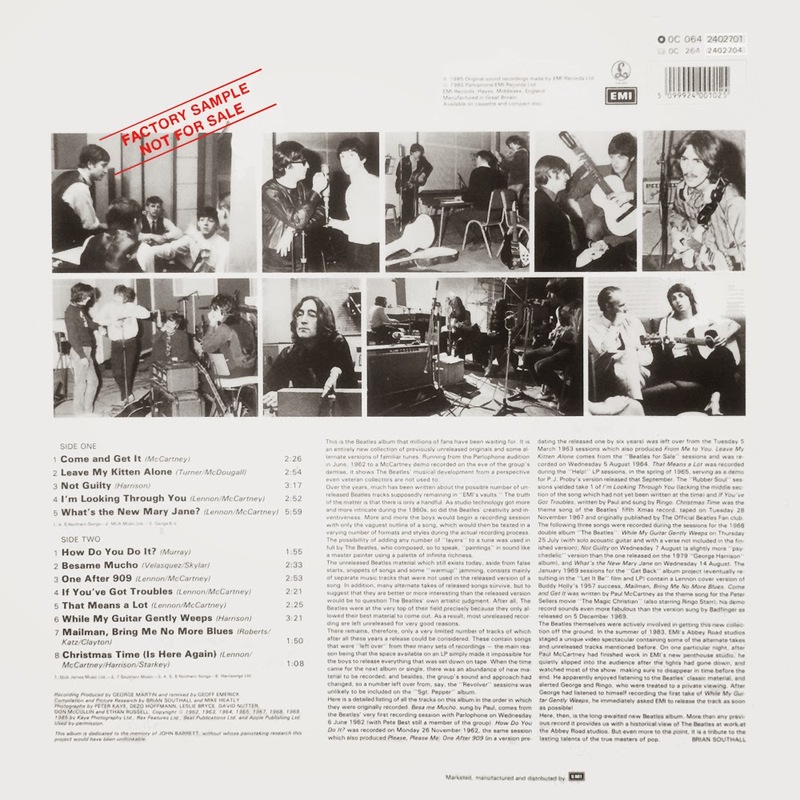 "The Songs Lennon & McCartney Gave Away" LP was released in several countries, including the UK, Australia, the Netherlands and Japan. The album has never been reissued as a CD, so here's a project for you, Universal/iTunes! It's not a complete collection, since a few of the songs these composers gave away to other artists are missing (see below). 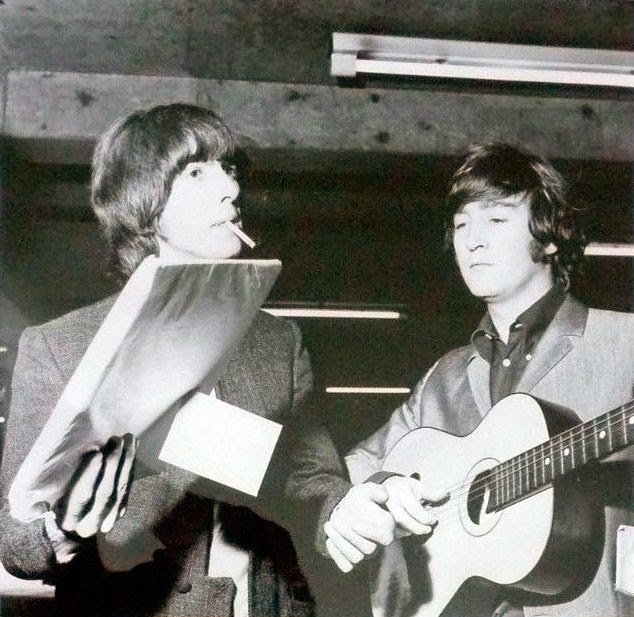 Here now is a collection of samples from "The Songs Lennon & McCartney Gave Away" compilation album and more, including some songs George Harrison gave away, plus the original versions played by the Beatles. This is just to give an idea of how the songs written by John Lennon, Paul McCartney and George Harrison sound like, by the artists who recorded the songs. If you want to listen the complete songs, you have to look for them yourself! Here are the titles and artists in order of appearance. 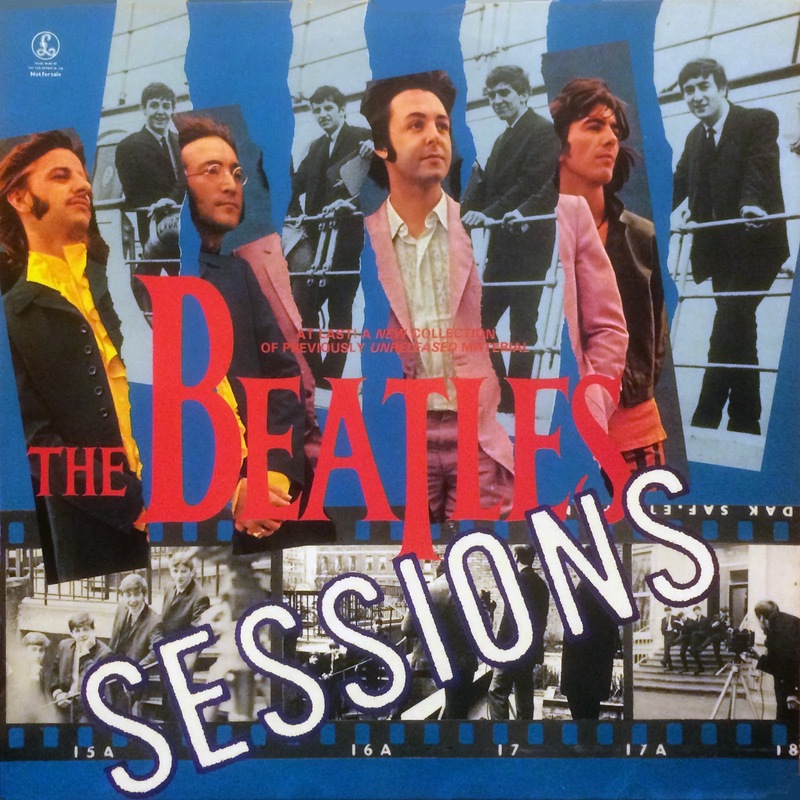 This collection is from songs the Beatles wrote for others but never recorded themselves with the purpose of releasing them for themselves. All of the Beatles' performances here were unpublished until they appeared on bootlegs and Anthology albums. From an idea of the Facebook page "The Beatles FanClub Italia"
New radio programme explores the myth. In 1969, with The Beatles in financial and creative turmoil, a strange rumour swept the world. It began with a phone call to a US chat show - Paul McCartney had been killed in a road accident and replaced by the winner of a look-a-like competition, William Campbell an orphan from Edinburgh. And there were clues that could only be revealed by playing the Beatles records backwards. It sounds unlikely, but millions of fans believed it. In this radio programme, we speak with the man who took that phone call, the hoaxer who developed the myth, and an expert on folklore who sees uncanny parallels with ancient myths about changelings and the darker side of fairies. What does this odd tale tell us about The Beatles' place in our cultural history? The programme includes out takes, clips from interviews and rarer versions of Beatles songs. Wherever possible or appropriate, raw sounding demo or instrumental recordings from The Beatles Anthology albums were used. 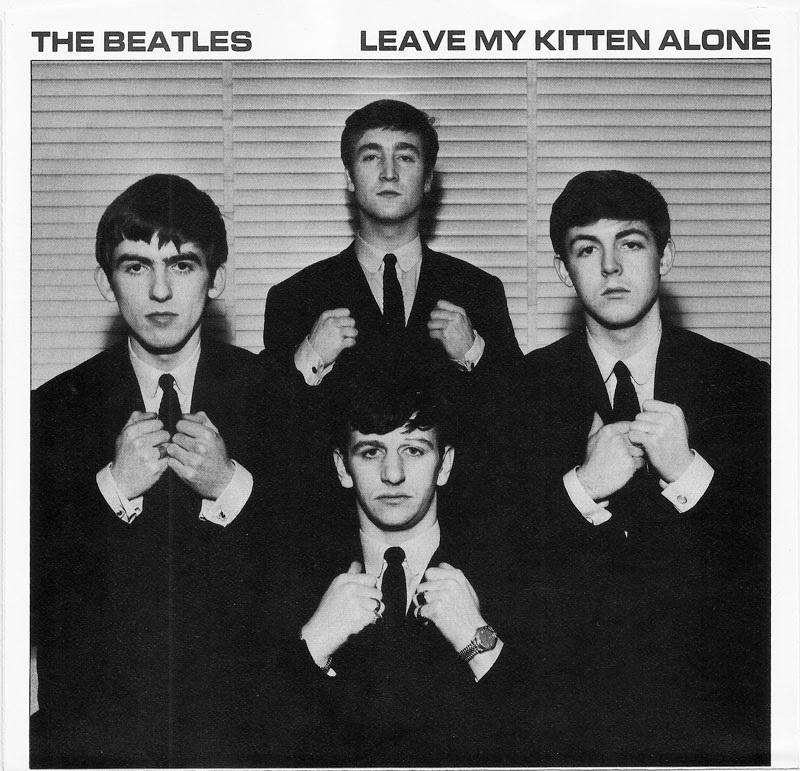 For ultra lush mixes, the remixed versions from The Beatles' Love album were used. Interludes and chit chat were from the Let it Be Naked - Fly on the Wall CD which contains out takes from the Let It Be film recordings. Timings refer to the actual programme start. 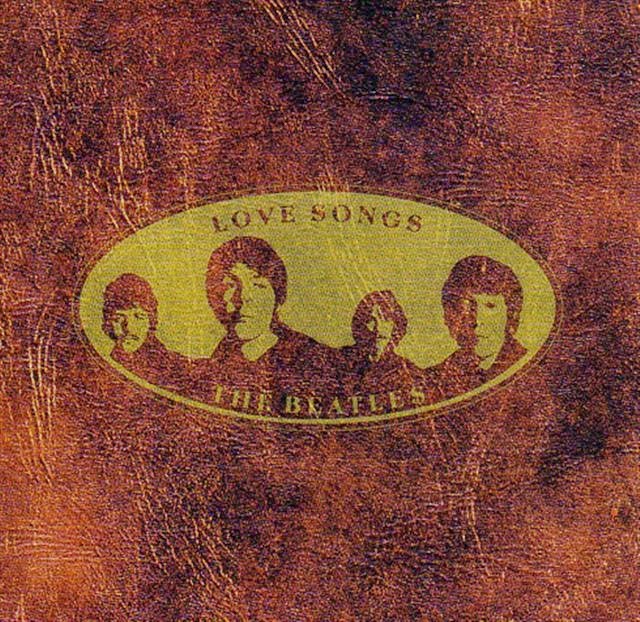 25.15 Octopus's Garden / Sun King (Remix) (Track 16 - Love, The Beatles). 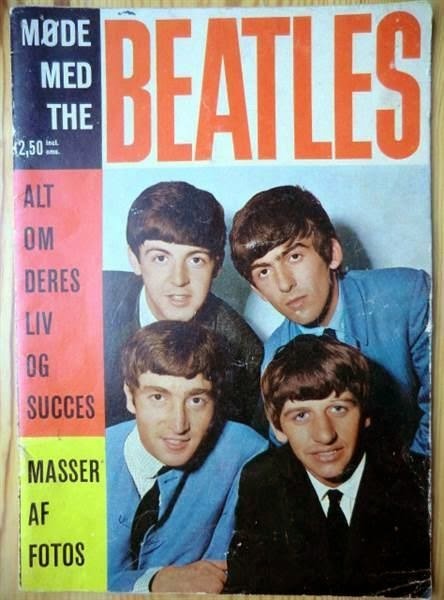 2014 Collector's Edition of the "Meet The Beatles" magazine. 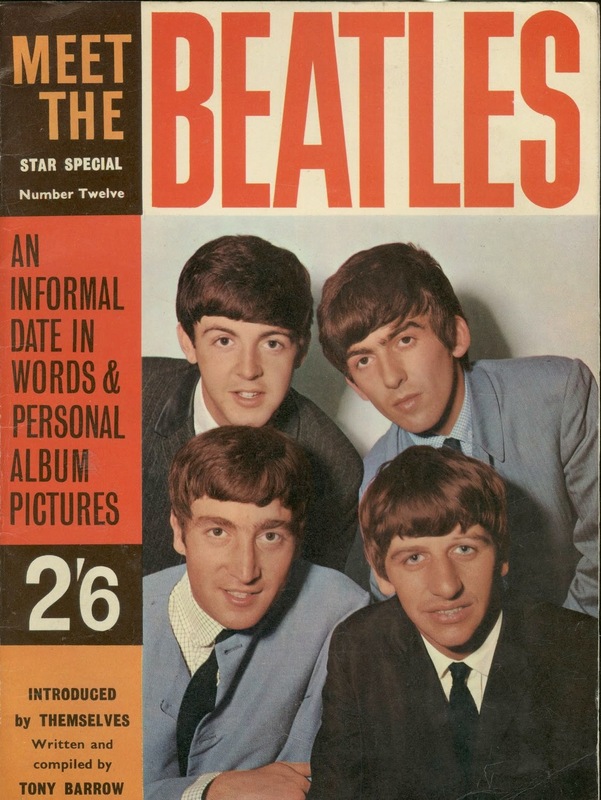 Souvenir Press Ltd, the company who released the magazine "Meet The Beatles" in 1963 has announced that the company will reissue the magazine on 3 November 2014. Some report that the new edition has already hit the news stands in the U.K. The company says that this will be a hardback collector's edition for a new generation of Beatles fans. Originally priced at 2 shillings and sixpence, the new edition will be priced £10 in the U.K., and $12,05 in U.S.A. The original had a soft cover. This is a faithful reissue of the original 38 page publication. And it is very much an introduction to the band, featuring a photographic day in the life as well as rarely seen images taken of their first London appearance and a performance on the TV programme Thank Your Lucky Stars. 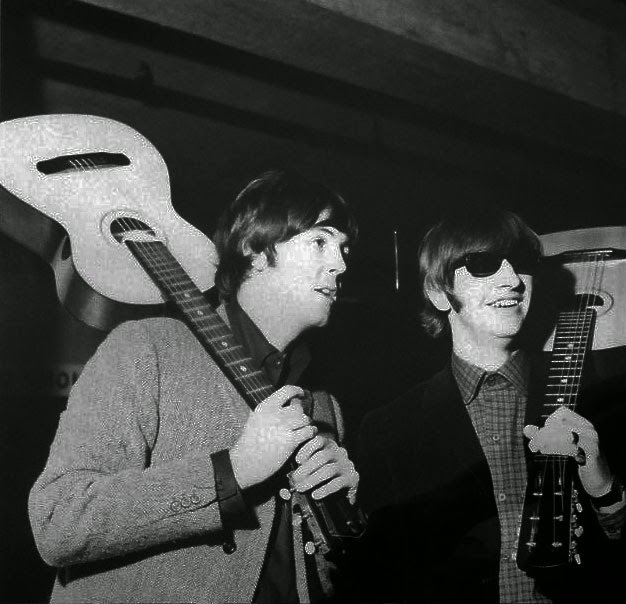 The introduction to the book comes from Tony Barrow, the man who coined the phrase "the Fab Four". Most of the photos were taken by Dezo Hoffmann, the rest were from Peter Kaye, Graham Spencer, Stan McLeod, Cyrus Andrews and ABC Television. 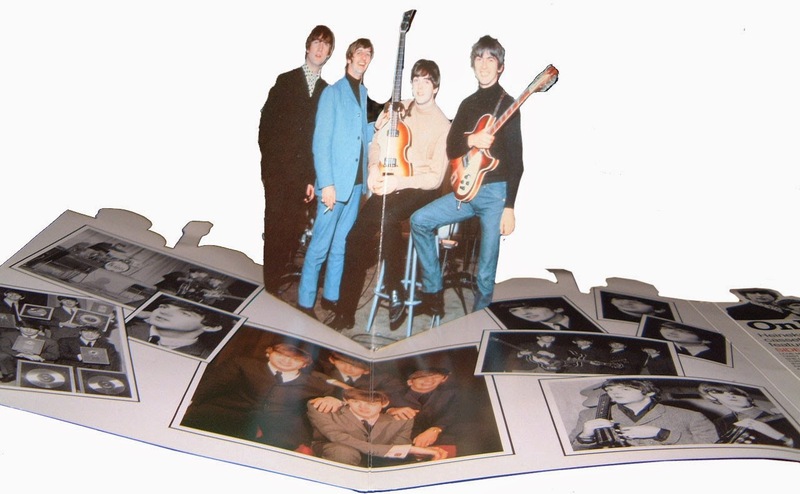 The original edition was the first official book the band released, after Ernest Hecht, founder and publisher at Souvenir, saw them play live in Finsbury Park, London, and bought the rights from the band’s manager Brian Epstein. The idea to reissue the title came from watching the 50th anniversary media reports about the band, as well as the publicity Mark Lewisohn's biography of the band has been getting. The original edition is Souvenir’s biggest selling title of all time, selling more than one million copies. The rights were also licensed to publishing houses in other countries, who offered translated versions of the book to their customers. Hecht wanted to keep the book exactly the same as it was, in order for it to act as a piece of memorabilia, and declined Tony Barrow's offer to write an updated introduction. To us, it's amazing that these people are still with us. 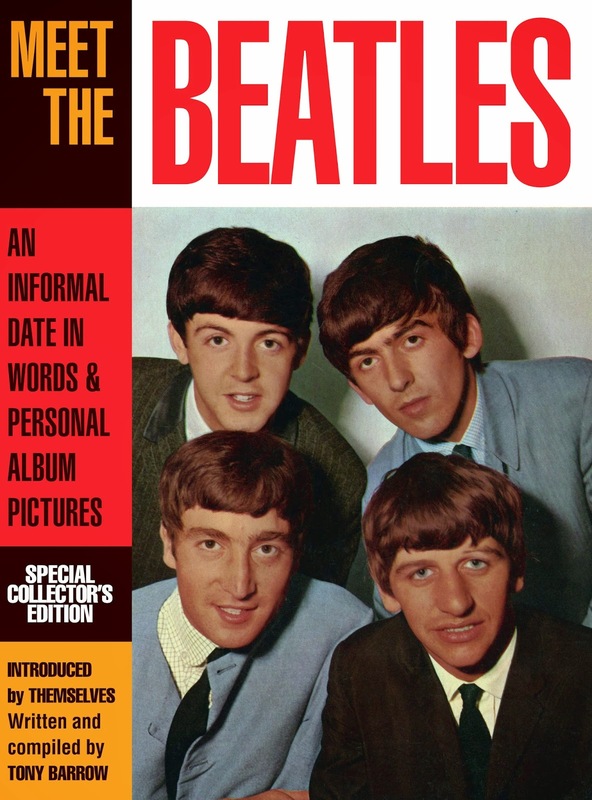 From Us To You - A Personal Introduction To "Meet The Beatles" By George, John, Paul And Ringo. 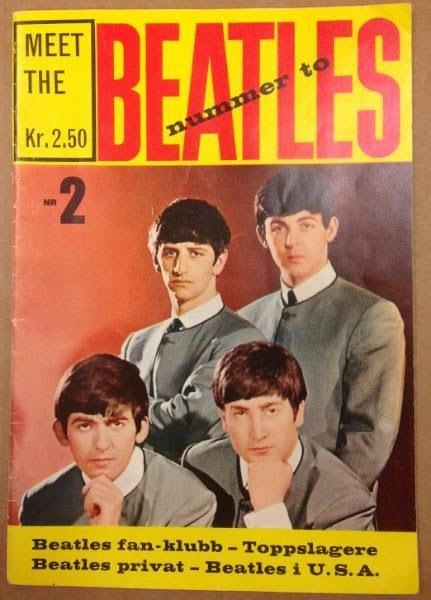 The Scandinavian editions of the magazine had a follow up, Meet The Beatles number two, I don't know if this was the case elsewhere as well? "Meet The Beatles no. 2" from Norway. But it's not No. 00000000001, it's actually No. 01! 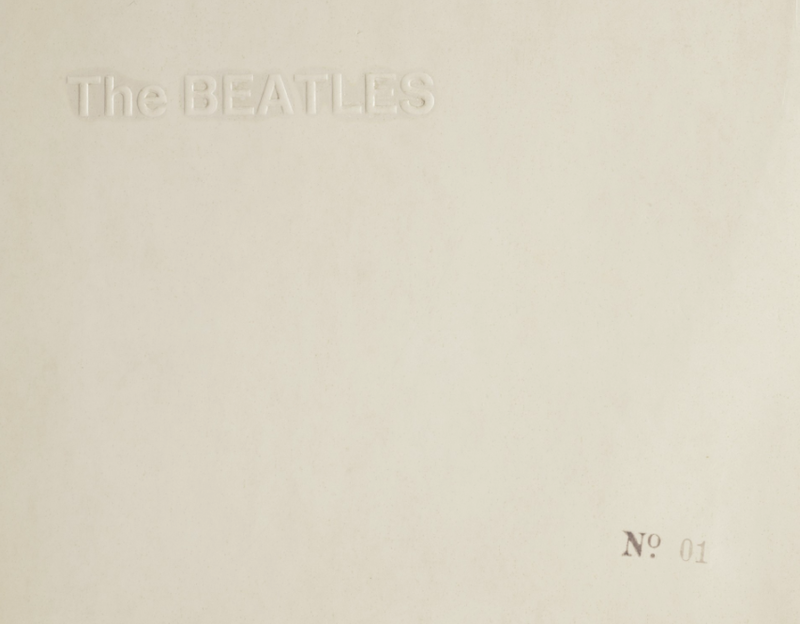 It's a 1st pressing of The Beatles (White Album) UK 1968 mono album, complete with poster and photos, and the sleeve is marked No. 01, a rare number variant. 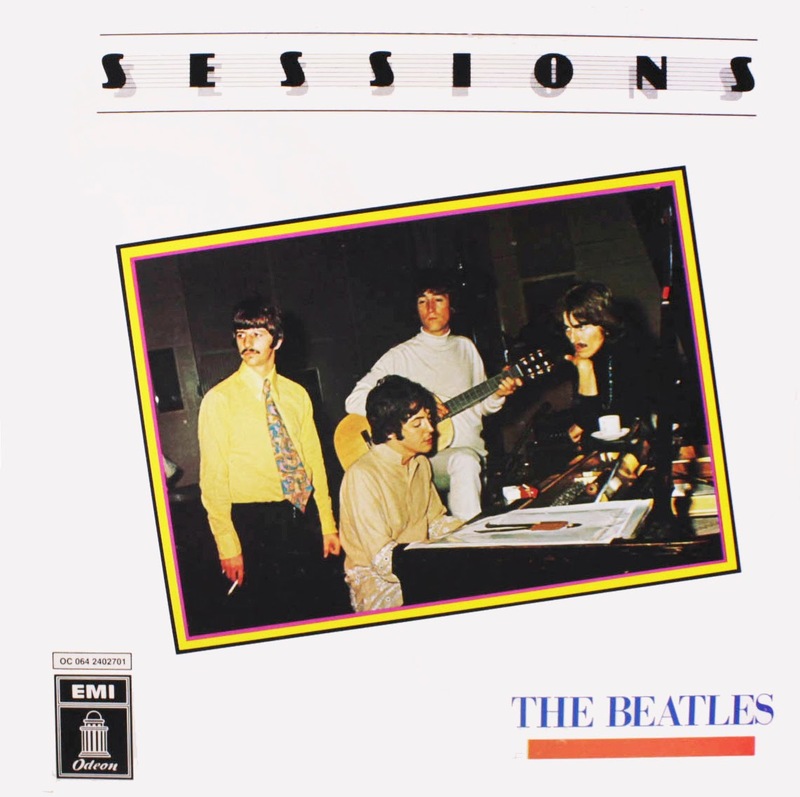 When purchased by the current owner, the previous owner said that this album had been given to him by an Apple executive who had worked for The Beatles. This apparently mis-pressed sleeve was subsequently gifted to him by one of the group. 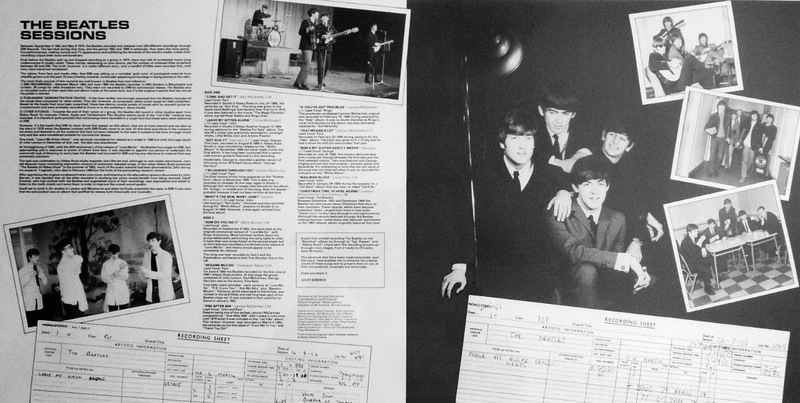 It is believed that The Beatles did not like the first sleeve enumeration system as they wanted more digits to allow all covers to be numbered and not just a batch with double figures up to 10, which Apple had delivered to their offices in Saville Row for the group. 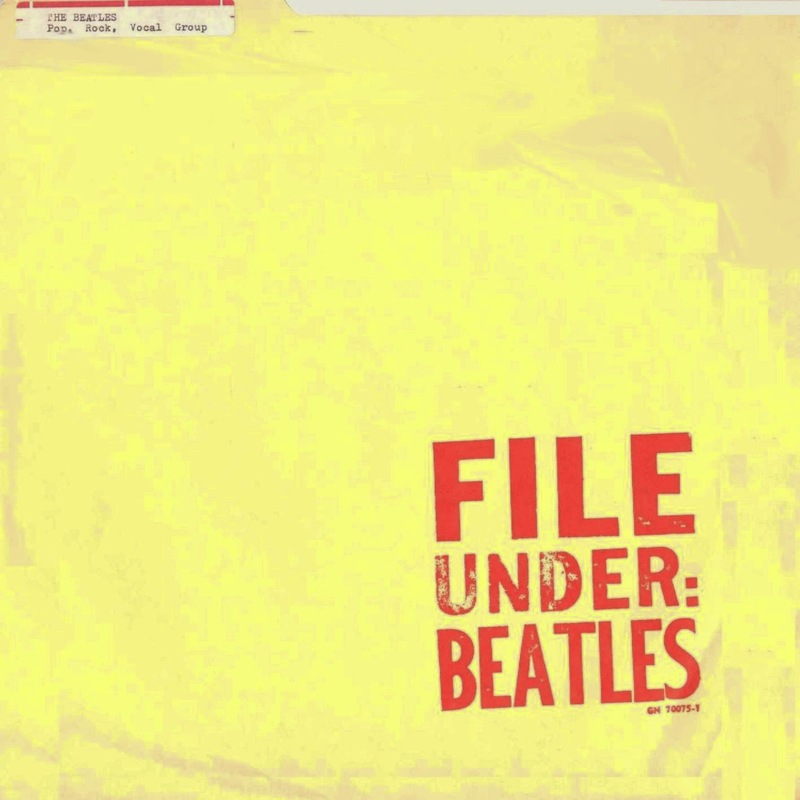 Subsequently it is believed that the printers added more 000s to accommodate the Beatles request and sent another batch to Apple, leaving the first run as very rare anomalies. The item is coming up at an auction is held by Special Auction Services (SAS) in Newbury, Berkshire on October 30. They have a price estimate at £4000 - £5000 (British pounds), and we think it will easily get that. The auction also features many other Beatles records, as well as leather jacket once owned by John Lennon. Who is that person beside the police van? This is an update about a mystery that we have previously covered. 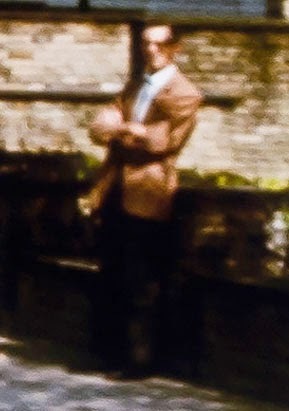 The update was made because we got hold of some Abbey Road photos that were in a higher resolution than earlier, which enabled us to take a closer look at the person in question. 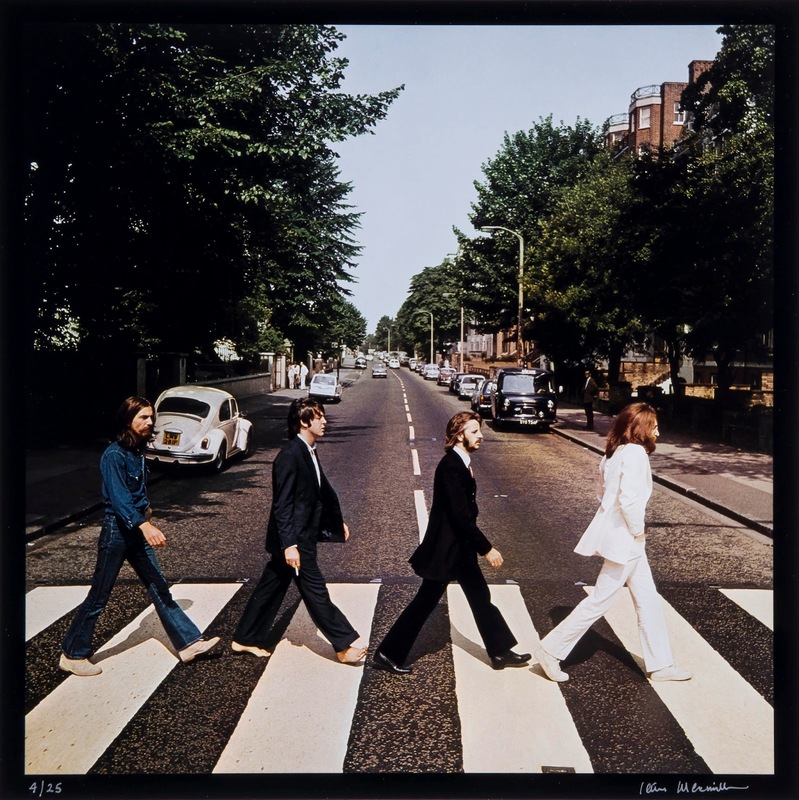 In February 2008, news was that Florida resident Paul Cole, by the media identified as the man beside the police van on the famous Abbey Road cover photo of The Beatles, had died, aged 93. But was he really that man? We don't think so, and here's why. Mystery man close up from the record cover. 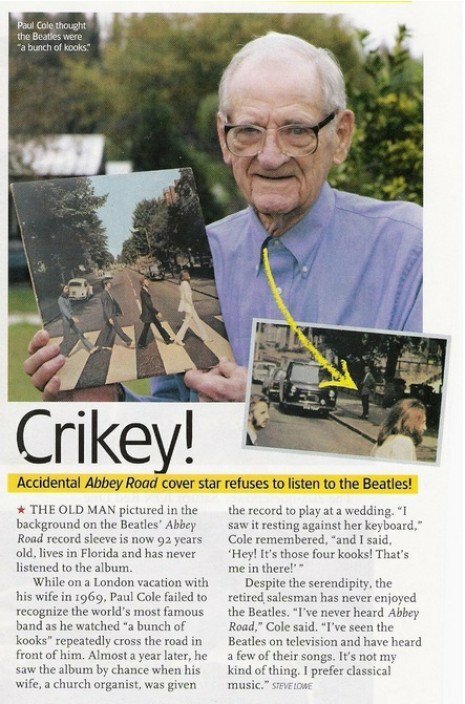 According to a couple of interviews he gave in 2004, Paul Cole was on the pavement while he was waiting for his wife, who was visiting a museum in Abbey Road. He was starting a conversation with the driver of the police van, and a bit later he realized that the police was there for a special occasion. When he looked over at the Beatles, he only recognized them as "A bunch of kooks, I called them, because they were rather radical-looking at that time. You didn't walk around in London barefoot". 1. There's a police van there. 2. Next to the police van there's a man standing. 3. One of the Beatles was not wearing shoes and socks. You can look closer at all these photos in our "The Road Goes On Forever" piece. Close-up made from photo #2. 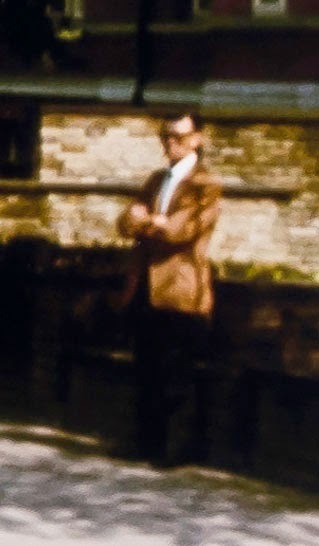 Here's a close-up from photo #2 of the "mystery man". 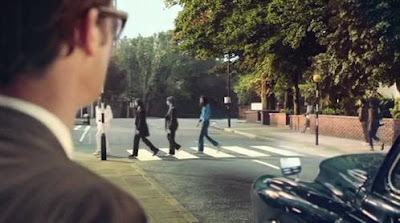 This is a reenactment from the recent The Beatles RockBand commercial, the scene seen from the "mystery man's" point of view. 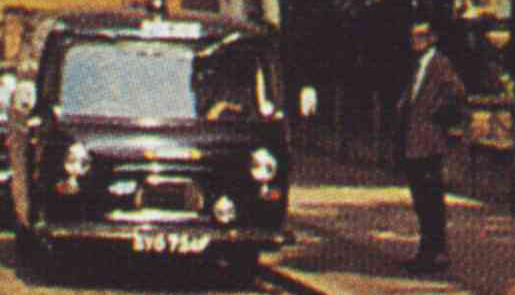 Earlier references to the "Mystery man"
Jo Poole: "At 21, I was a dedicated Beatles fan, and bought the 'Abbey Road' album the moment it was released. As soon as I saw the cover, I shouted, 'That's my brother, Tony.' He was 33, and was very distinctive at six feet four inches tall. Tony Staples was his name and he lived in Scott Ellis Gardens, near Abbey Road, and regularly saw the occasional Beatle, though catching a glimpse of all four Beatles together was rare, even in Abbey Road. He was on his way to work as an administrative secretary for the National Farmers Union on the Friday morning when that photo was taken. I used to travel regularly from my home in Gloucestershire to visit Tony in St. John's Wood, and I remember him pointing out Paul McCartney's house." 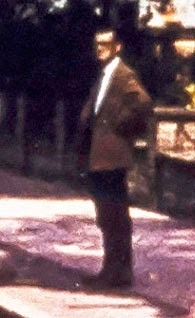 Of course, since Paul Cole was the first of the "mystery man" candidates who managed to get in the news during the internet age (2004), and because he was referred to as "the man on the Abbey Road cover" in an obituary that was widespread all over the internet (2008), AND because the job of research has been abandoned along with the proof reading job by the media at large, it has become almost impossible to google and find all those other, previous claims (from the pre-internet seventies) about the identity of the man. In 2004 and 2008, a news item such as this could "go viral". 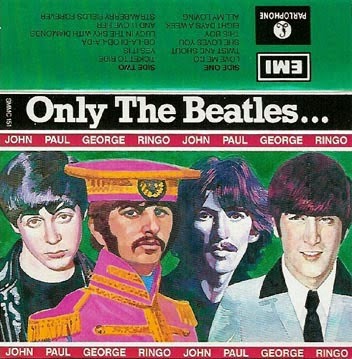 In the seventies, it would have been published in a small, amateur Beatles fanzine and read by the die-hard subscribers only. 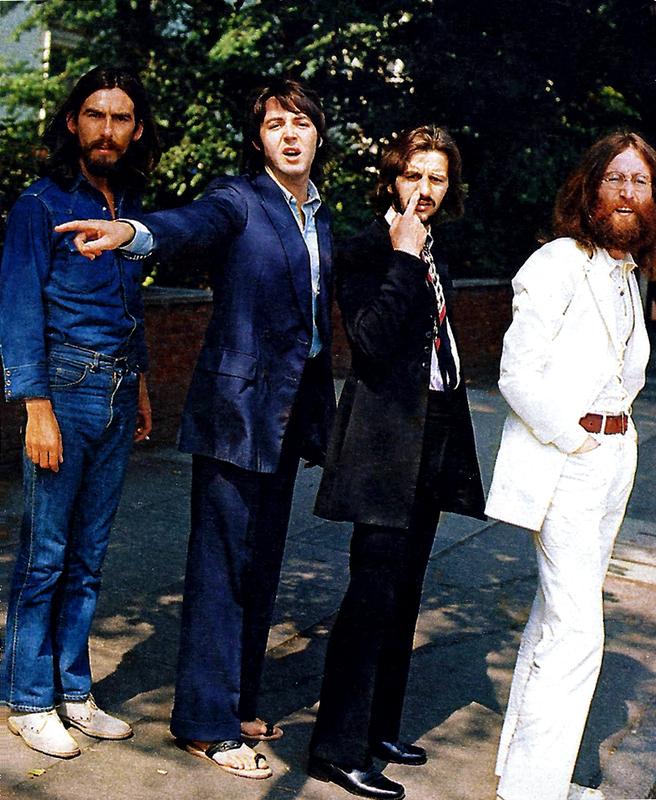 This post is part of the all-encompassing article about the Abbey Road photo cover session, which you can find here. Does the SHM-CD format bring some extra texture to the music? 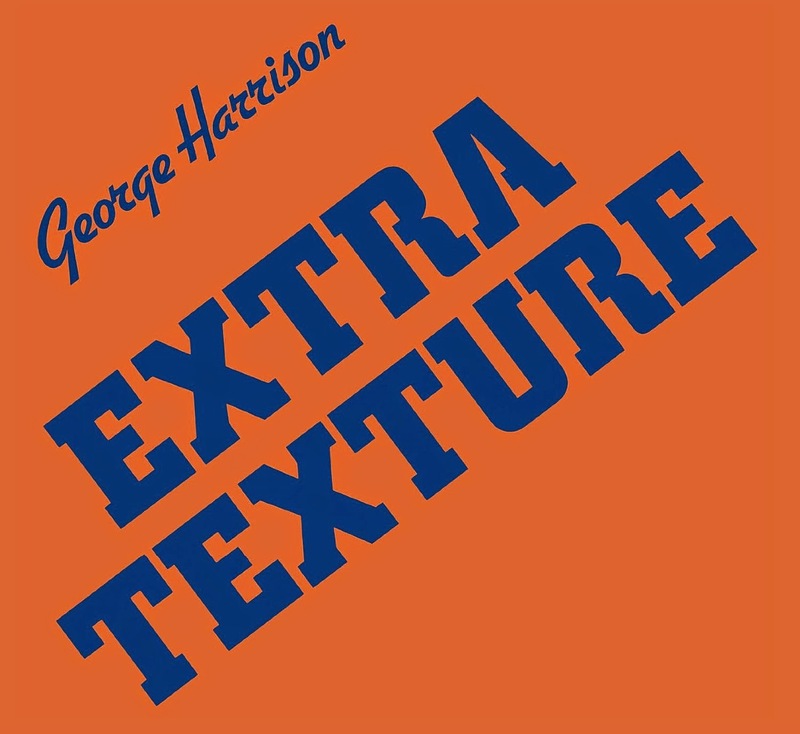 One of our readers has alerted us to the fact that on October 28, George Harrison's individual titles which were in the Apple Years box are all being released in Japan as SHM (Super High Material) CDs. This comes hot-on-the-heels of other news reports about SHM-CDs from John Lennon and Paul McCartney. Since the SHM-CDs conform to the CD redbook standard, we are in doubt whether the use of a different coating material will do anything for the quality of the music.